Hotel Design Secret de Paris **** is a design boutique hotel located in the Trinity quarter, 9th district (Paris, France). 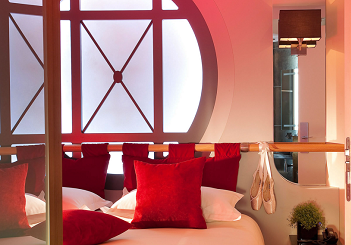 Every bedroom has got a beautiful decor representing the inside of a Parisian monument. The idea is to discover the City of Light through the different rooms of the hotel. The visitor extends his visit of the day to become here a privilege guest of a secret place. A total of six themes declined on twenty-nine rooms : Tour Eiffel, Moulin Rouge, Trocadero, Opera Garnier, Musée d’Orsay and Atelier d’Artiste. Every detail has been chosen to suggest the most romantic atmosphere. All our rooms are equipped with chromotherapy bathtubs or spacious showers. We also have a downstairs relaxating area open 24hours (sauna, steamroom, fitness). Most of our clients come to our Hotel for romantic reasons : proposals, honeymoon, anniversary..
Today our Hotel is ranked #17 of 1792 hotels in Paris on Trip Advisor. For any further information please do not hesitate to contact us. We would be thrilled to be part of your inspiration!